Users are reporting that the new 15-inch MacBook Pro is throttling speeds because of heat issues. On paper, Apple’s new 15-inch MacBook Pro is a beast. The slim laptop comes in a variety of configurations that range in cost from $1,300 to upwards of $7,000. One of the big draws this year is the option to upgrade the 15-inch model to a an Intel i9 processor. The six-core 2.9GHz processor is a powerhouse and comes unlocked and overclockable, meaning users can push it to run even faster. But Apple fans are skeptical, especially after one YouTuber benchmarked the i9 model and discovered it throttled the CPU’s processing speed when trying to render a video in Adobe Premiere. Now, Apple fans on Reddit, Facebook, and Discord are complaining about the i9 and the few people who’ve already got the new MacBook Pro are running benchmarks and pushing the machine to the limit. It’s a telling reaction from a community that’s lost some trust in Apple. Last year the public learned it throttled iPhone batteries in older phones to encourage people to buy new ones. 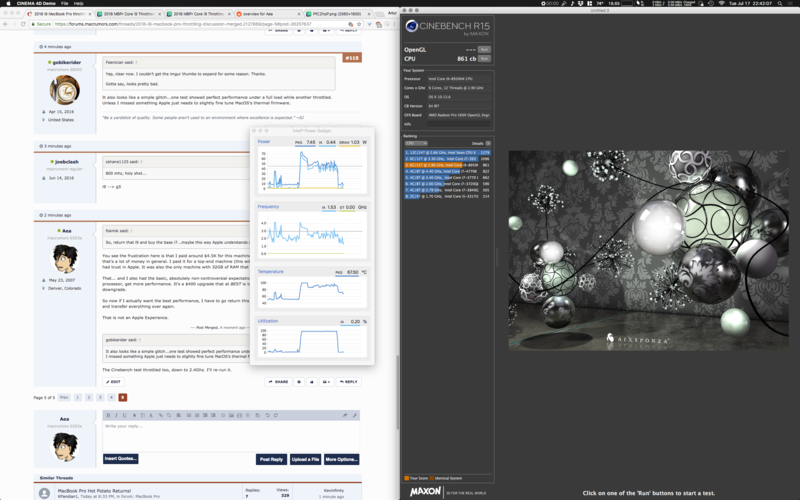 Redditor Aea discovered his MacBook pro slowed down after 5 minutes of running Prime 95—a CPU intensive number crunching program. After just one minute of Prime 95, the i9 had dipped from a 2.9 to 2.5GHz. Cinbench—another benchmarking program—showed similar dips in performance. Several other redditors on the thread chimed in to say they’d gotten similar results and planned to return the MacBook Pro to Apple. YouTuber David Lee—who does hardware reviews and tutorials at his channel Dave2D— explained the problem in a video posted Tuesday. “It’s a very powerful CPU, when it comes to multi-core applications, this thing is a beast,” Lee said. “The problem is that when it comes to this chassis, the MacBook Pro can not cool the i9 properly.” Lee tested the chip by rendering scenes in Adobe Premiere—CPU intensive video editing software—and found that the new MacBook can only hold the i9’s base clock speed of 2.9GHz for a few seconds before it throttles the speed down to 2.2GHz to prevent it from overheating. Lee further tested the processor by rendering a video in Adobe Premiere and comparing it to last year’s MacBook Pro i7 and the same Aero 15x. Adobe Premiere isn’t optimized for Apple products and the Windows machine blew through the render in just over seven minutes. Last year’s MacBook Pro i7 finished the render in 35 minutes. Lee’s i9 took almost 40 minutes, a full four minutes more than last year’s model. CPUs run hot, especially when they’re performing intensive tasks. At high heats, the processors have to slow themselves down or risk damaging themselves. Engineers compensate for this by seating CPUs in a thermal compound designed to conduct heat away from the CPU and into heatsinks. iFixit, a site that teaches people how to repair their own electronics, recently performed a teardown of the i7 model of the MacBook Pro. Other than the keyboard, iFixit found the inside of the MacBook Pro to be similar to previous models and gave the machine a repairability rating of 1. Image: Cinebench results via redditor Aea. It would help, but it wouldn’t fix the problem. Ultimately, the only way to get the current generation of i9s running to spec in a MacBook is to radically redesign the laptop’s chassis. Apple did not immediately return our request for comment.